I don't think I've seen Kiely so happy. We drove to Arizona and picked-up the most wonderful horse. 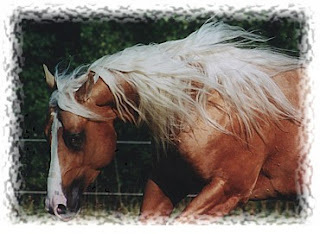 She's Sahara, and was raised by a young lady from the time she was a foal. Sahara hadn't been ridden in a year, but was honestly, for a greenbroke, 5 year-old, she is an outstanding horse in every way. I think I love her almost as much as Kiely. She's Kiely's Flika. The horse had never been trailered, but went home on an 9 1/2 hour drive home in 106 degree weather. We stopped lots for water and treats. Believe it or not, she likes to go in the trailer now. 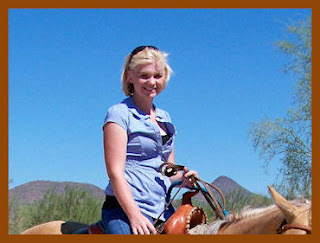 Kiely has ridden her constantly. Kiely did slide off when the horse reared. But all is fine, she spooked at the sound of a hula hoop that sounded like a rattlesnake. (Now, isn't that a coincidence? Arizona-rattlesnakes-we HAVE rattlesnakes. Duhr.) Then, Sahara jumped and bucked over a small fence and landed in a not-stickery catus...and got tangled in a metal chair. Kiely was under Sahara; and she only stepped on her leg with her front hoof. The horse spread her back leg so not to hurt Kiely. Of course she "cowgirled up" after Steve and the fire department gave her the okay.(Dang! Another call to our house) Kiely just got on Sahara about 4 or 5 more hours, she didn't even put Sahara away, slide off a horse and what's the rule of the west? Get back on. She had only one small bruise on her calf of her leg. I'm thankful for the lawn being so soft from the sprinklers that day. Corbin was on the horse with her and he was laughing-he slid off just like Kiely, only first. I remember those days. I'm thankful that they were not hurt or even shaken. I'm grateful to such a sweet horse that loves my daughter so much that she would step in a metal chair to get away from hurting her. We all saw it. Grandmothers, aunts, uncles, sisters, and cousins. The whole thing was in slow-motion. My mother wanted to put Sahara in the pen and Kiely said, "I'm okay, I'm still riding with Randy." And she did. Jurassic Park is in our Oak Grove and this is just a very happy posting. She needs a BFF (Best Friends Forever!) We are all happy for her. Kiely has been praying for another horse and crying about Boogie for over a year. She now has a treasure. Mark Modine, George Larkin, Thorton Lee Jewkes, David Ross Jensen, The Missionaries, And Member Missionaries. I Was Blessed To HaveThem In My Life! I'm so TACKY these days! Scrolling Marquee of Blogs I Follow. Catch Them! Blog Archive. I'm a Mess! I'm Soooo Confused? Is It Spring? Captain Lazenby Is Very Handsome. Is It Spring? What is Going On here? P.M.S. Sunday. Not so Bad. First; Not So Good! Do you know the DIFFERENCE in GOATHEADS?